The legislative delegation representing North Central Arkansas has given its support to a bill awaiting the governor's signature cutting in half the license fees for carrying a concealed handgun. The measure would cut the initial filing fee for a concealed handgun license from $100 to $50. It would also cut the license renewal fee from $50 to $25. Representatives Nelda Speaks of Mountain Home, Jack Fortner of Yellville, John Payton of Wilburn, Michelle Gray of Melbourne and Marsh Davis of Cherokee Village were among the 70 House of Representatives members voting in favor of the measure Monday. The measure passed with 70 in favor, 18 against, 11 non voting and one present. Speaks' district includes a portion of Baxter County; Fortner's portions of Baxter, Marion, Boone and Searcy counties; and Payton's portions of Baxter, Marion, Stone, Searcy and Cleburne. Gray's district includes portions of Izard, Sharp, Stone and Independence counties, while Davis' district covers portions of Baxter, Fulton, Sharp and Randolph counties. Last week, local Senators Scott Flippo, Missy Irvin, James Sturch and Breanne Davis were among the 25 in the upper chamber of the legislature supporting the measure. The measure passed with 25 in favor, eight against and one non voting. Flippo's district covers portions of Baxter, Marion and Boone counties; while Irvin's includes Searcy, Stone and Cleburne counties, as well as portions of Baxter, Fulton, Marion, Faulkner, Van Buren and White counties. Sturch's district covers Izard, Independence and Sharp counties, as well as portions of Fulton and Randolph; while Davis' covers Newton and Pope counties, along with portions of Boone, Carroll and Van Buren counties. All of the North Central delegations are republicans. Governor Hutchinson has said he supports the cut in fees. Arkansas State Police has said the financial impact of the proposed fee cut would be $1.2 million. 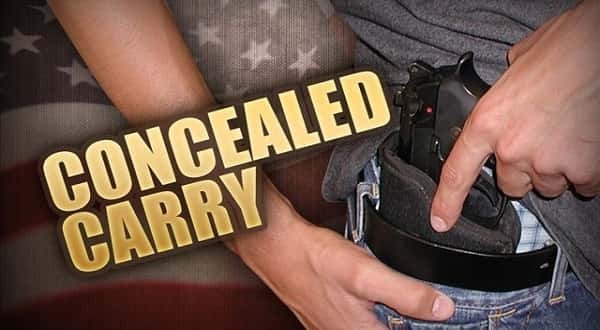 Arkansas has more than 224,000 concealed carry license holders.